Seneca, S.C., and its transit operating partner, Clemson Area Transit (CATbus) made the decision to switch the entire diesel bus fleet to EV (electric vehicle) buses. Seneca, S.C., and its transit operating partner, Clemson Area Transit (CATbus) made the decision to switch the entire diesel bus fleet to EV (electric vehicle) buses. Fleet managers weighed all of the options available on the market, including diesel, CNG, hybrid and fuel cell buses, before choosing EV models. Seneca and CATbus chose Greenville, S.C.-based Proterra to supply the fleet with Proterra zero-emission 100 percent battery-electric buses. The selection was made after a lengthy qualifying process. After passing stringent field-testing, the CATbus vehicles went into full-time service in September 2014. Performance has met expectations and fleet operating costs have decreased. 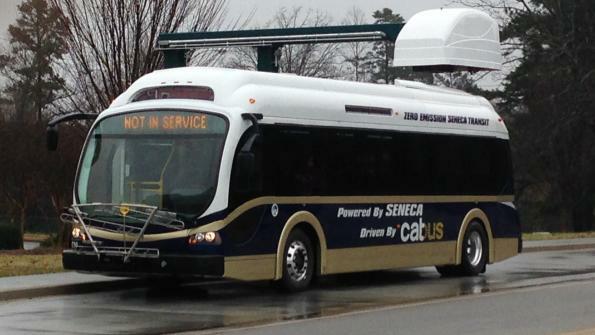 Seneca has since purchased two additional buses and has chosen to convert its entire fleet to EV. That decision makes Seneca the first city in the United States with an all-electric bus system. Learn more about Proterra here.